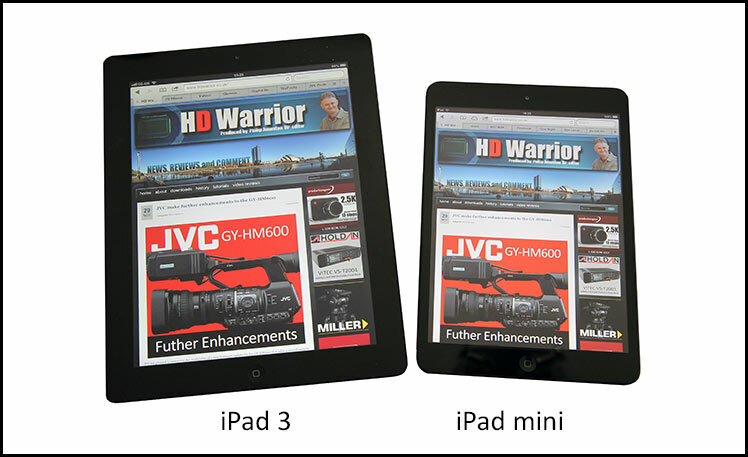 Welcome to the bigger better HD Warrior, it’s took two years to establish ourselves and I think the new look is fantastic, though I am biased. One of my regulars emailed me to tell me that it was “huge” compared to the last version…it’s gone from 850 px to 1200 px making HD Warrior future proof and a cracking read with far bigger, more detailed photography. We now have four site sponsors so please support them by clicking on their adverts and having a browse around their web sites. 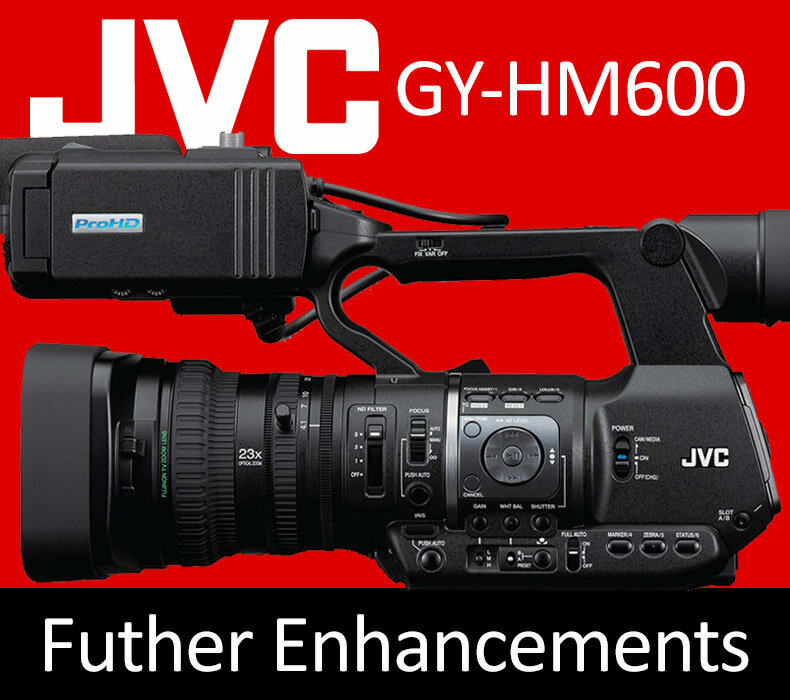 JVC are pleased to announce the availability of a new firmware update for the GY-HM600 that adds a second camera mode which optomises the camcorder for use in ideal lighting situations. 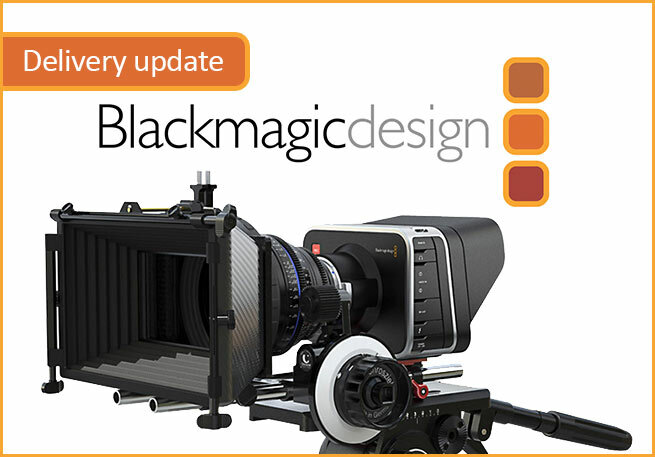 Also included are a range of new features and the correction for 1080 25p recording. 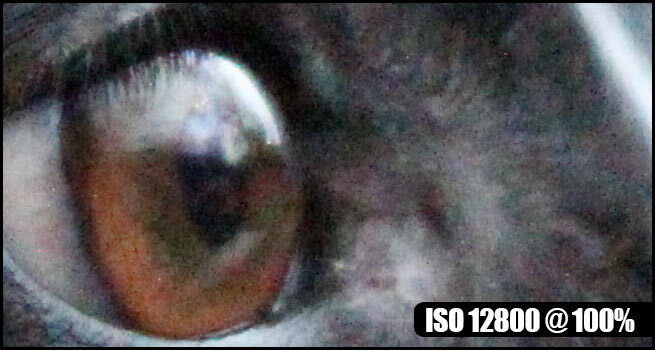 – “Standard Mode”: For shooting under controlled lighting conditions optimizes iris range and gain for best results. – “Extended Mode”: For news shooting under non ideal lighting situations with the emphasis on maximum gain and image capture under difficult conditions. Various improvements of camera functionality and signal processing for even better performance and image quality. The firmware should be downloaded onto an empty, formatted SD/SDHC card for installation in the camera. Full instruction are included with the file. 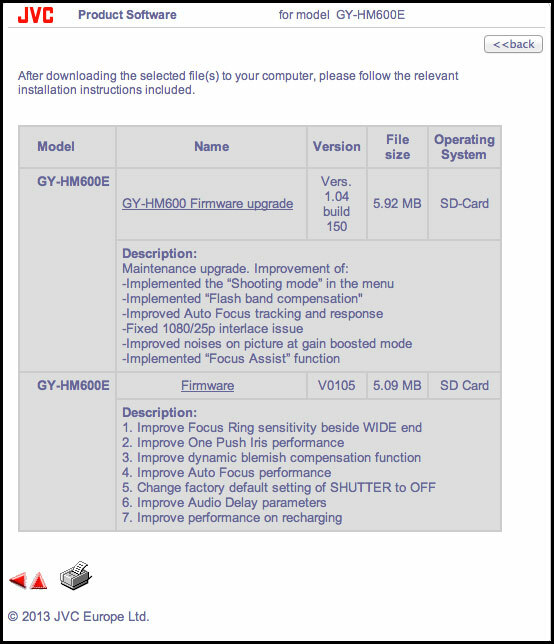 The update can easily be done by your customers in the field and units will not be required to be returned to either JVC or to dealers. Customers are required to register their unit to gain access to the firmware as part of the download process. In Standard mode you will not be able to access -3 and -6dB, it only starts at 0dB but the overall noise has been reduced..less sensitive but better pictures. Best image performance in normal lighting conditions. In Extended mode you get -3dB, -6dB giving you more manual control over your gain, increases sensitivity for low light. NOTE : Many of you were hoping for 1080 50p well this has not been dismissed, JVC Japan are looking into this so lets hope they can work this into the 600 range sometime during 2013 along with syncro scan. MAT BOX PrimeCircle – the radiosity pollution killer! from LockCircle on Vimeo. Some good news. If you have read my other posts about the causes of the camera delays then you know we have been dealing with a problem with our sensor supplier related to contamination of the glass that’s bonded on the front of the sensor. It’s not been clean and so we had to stop production of cameras. Also, the sensor supplier has done a small run of sensors at the new company that’s bonding the glass and they got almost a 100% pass rate, which is also great. This means they finally have a solution to bonding on the glass that looks like it will work. The plan at the moment is to do a small production run this week and we hope to get those sensors next week where we can build cameras using them and see how it all goes. But things are looking quite good. This run of cameras next week will test the sensor supplier’s ability to build sensors without contamination and to also be able to test them correctly so we only get good sensors. If that’s all ok then we look like we will be able to move back into production. I will update everyone next week when we know. I also hope to have more info on how fast they can ramp up with this new supplier and the new test. I hope this update helps. 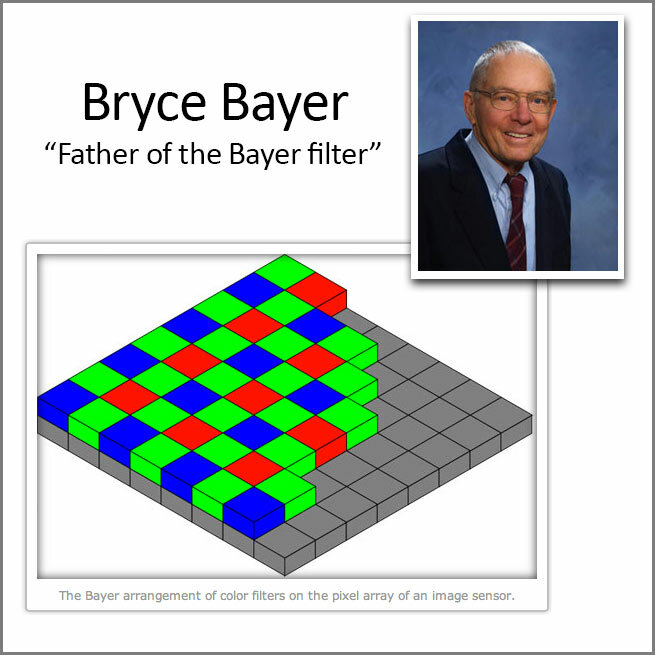 Mr Bryce Bayer, father of the “Bayer filter” has sadly passed away aged 83. Known as the Bayer Filter, Bayer’s invention is still used in nearly every digital camera, video camera and camera phone on the market today. The Bayer Filter array was patented in 1976 (U.S. Patent No. 3,971,065) and features a checkerboard arrangement of red, green, blue filters that enable a single CCD or CMOS imaging sensor to capture color images. 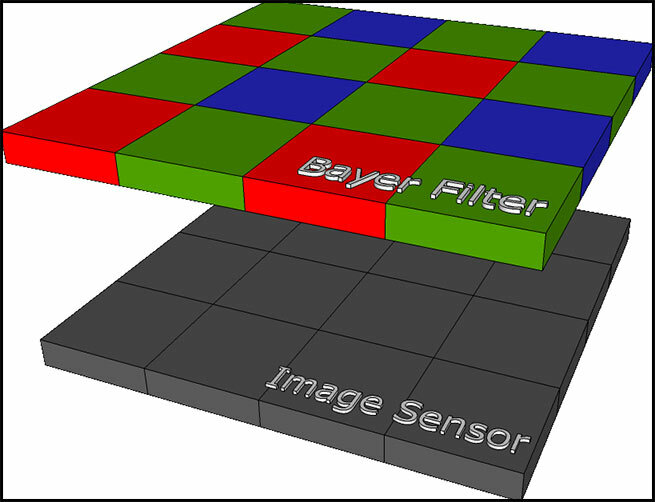 The three color filters in Bayer’s array are needed to create color from the greyscale image information that’s captured by the imaging chip. Prior to Bayer’s invention, three separate sensors attached to a beam splitter were required to capture a color image but that set-up was too large and expensive to find mass appeal. Bayer’s more economical array is designed to mimic how the human eye perceives color, with a filter pattern of 25% red, 50% green, and 25% blue, which is typically known as RGB. (The extra green pixels are because the luminance channel of the human visual system is centered in the green portion of the spectrum, and it’s the luminance signal that contributes most to our perception of detail.) 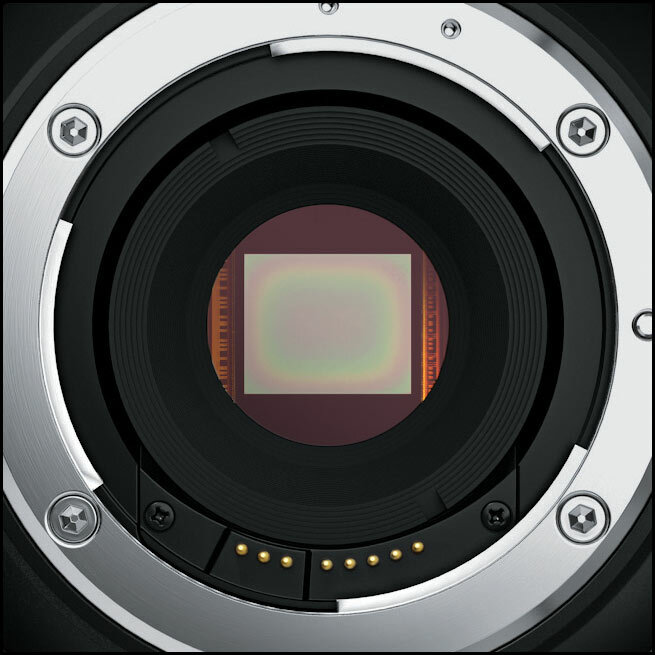 The color filters are fabricated directly on top of the light-sensitive pixels in the image sensor as it’s manufactured. An image captured with a Bayer-filter camera is known as a Bayer pattern image. This raw sensor output must then be interpolated using demosaicing algorithms for the sensor to produce an accurate image, with full red, green, and blue image data for every pixel. Along with his color imaging work, Bayer developed key algorithms for storing, enhancing, and printing digital images. Bayer retired from Kodak in the 1990s after a long career at the company. We salute Bryce Bayer for his huge contribution to digital imaging; a significant portion of the entire human population benefits from his invention every day. We offer sincere condolences to his family. Recently I have been reviewing my JVC GY-HM600 footage and I have to say at 0dB the camera copes very well with noise considering it’s only got 1/3″ chips. 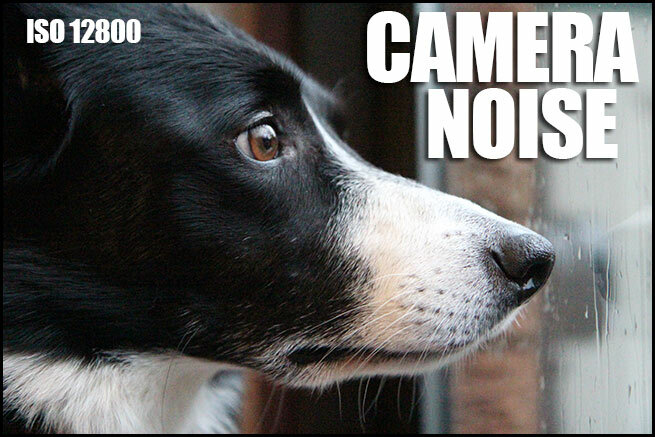 All noise is subjective but ever since the Sony PMW-EX1 camcorders, noise has in general improved. The EX1 was the first camcorder to sport the new 1/2″ chipset and created a relatively noiseless picture, certainly on playback. If you pause video footage the picture will look noisier, although we don’t appreciate it video is as organic as film in a lot of ways. The photograph at the top of the page is the same picture above, as you can see at 100% the picture is fluffy due to noise but the noise is subjective depending how the picture is viewed. As a web picture at 655 pixels you would not be any the wiser, on a 27″ iMac at 100% it looks awful. This is the problem with HD video in general, most of us view raw footage out in the field on a 3-9″ OLED screen so you are not picking up on noise till it’s viewed back on a 42″ HD screen. My first rule of thumb is that no matter what I film with I start with 0dB, if light is still a problem I move over to ND filter 0 or clear, then check my shutter speed is 1/50th. 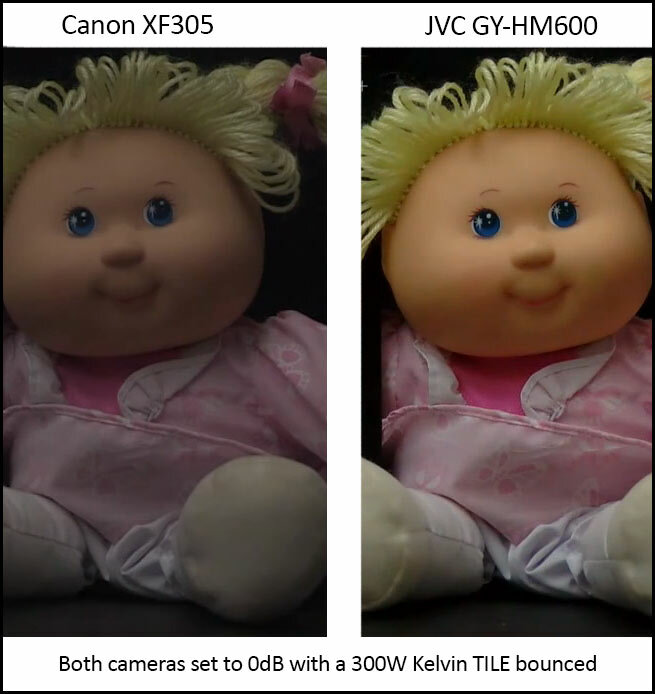 That’s why the new JVC GY-HM600 is a good run and gun camera because it lets in a lot more light at 0dB than the Canon XF305 as is clearly demonstrated above. 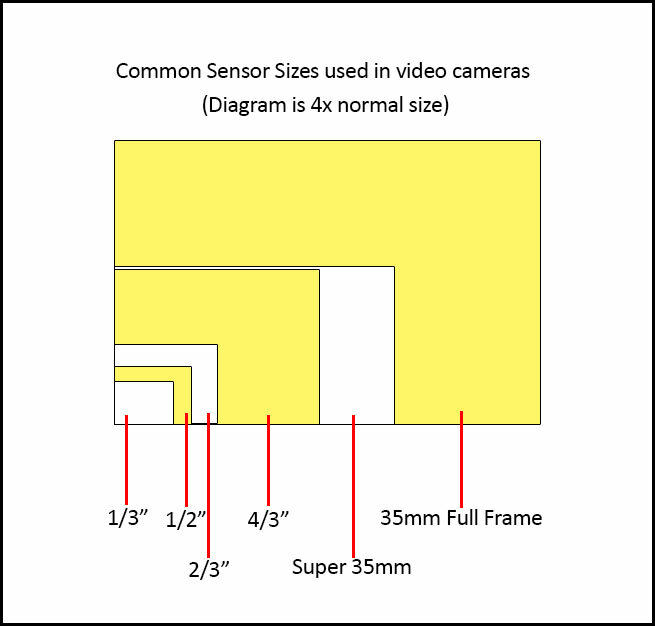 The second rule of thumb for video cameras is sensor size, if you want relatively noiseless gain then choose a camera fit for purpose, theres no point buying a 1/3″ camcorder then hoping it will cope well in a dark environment by shoving up the gain. The smaller the chip the more noisy it will become beyond 0dB. My Canon C300 produces remarkable pictures at 12dB but is cumbersome used in a run and gun mode. Equally the Sony NEX-FS100 is also very good in low light so the larger size Super 35mm chip gives you the added bonus of shallow depth of field plus a lot less noise beyond 0dB. It’s a trade off, larger chips give you larger cameras and lenses while smaller 3 chip cameras give you far neater camcorders with 23x lenses but at the cost of noise and larger depth of field. 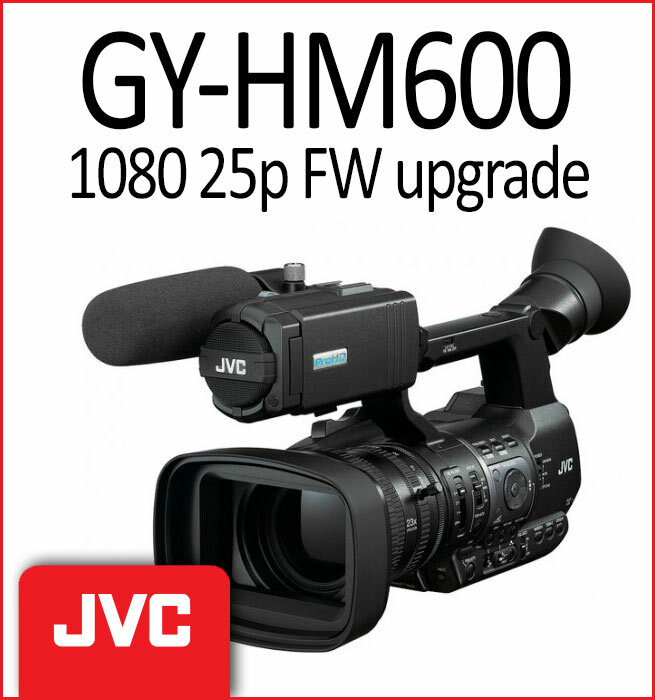 As promised by Kris from JVC the new firmware update allowing you to film at 25p instead of 25i. My example comes from the Autumn leaf above, it looks bland in black and white yet add colour and looks a million dollars…my point being it was taken in colour and reprocessed into B/W to prove a point. Steven Sebring ” Mirrors ” for WOLF magazine from WOLF Magazine on Vimeo. The example above was shot on the Epic M camera but if I am being honest my Canon C300 could have done as good a job taking the colour out in post. 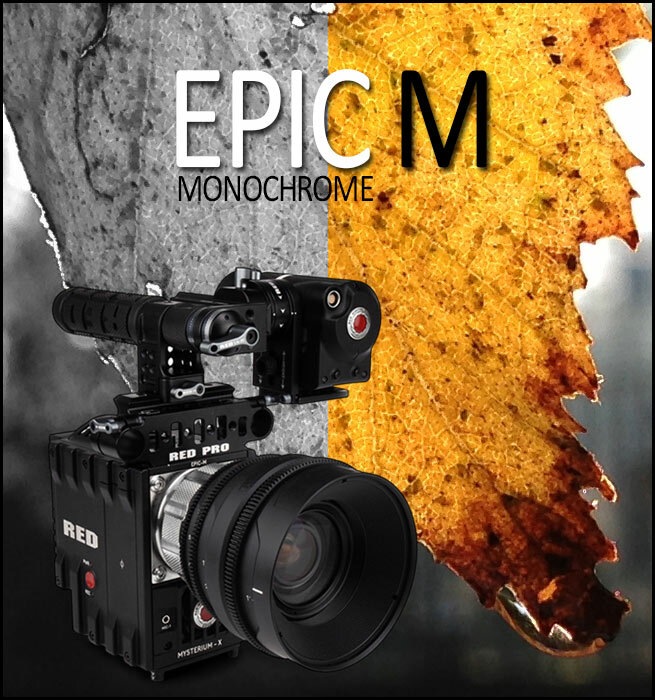 The RED EPIC M seems to be a fancy DSLR taking advantage of the hi resolution stills that can be taken from the video footage but do you really need to go this far to get fancy monochrome stills/video. 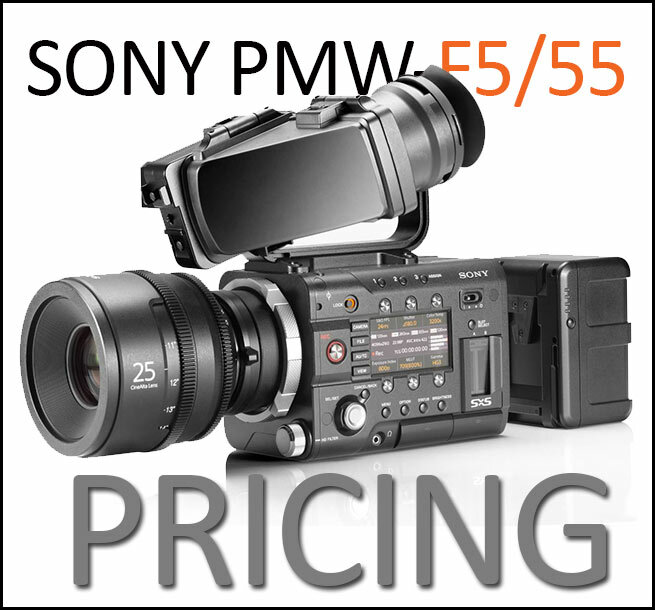 So much can be done in post these days that I think this camera is a step to far, the emperors new clothes come to mind, I would not spend any amount of money on a monochrome only video camera especially one costing $25,000, that kind of money buys you a Sony 4K PMW-F55. It’s “trending” once again, RED are trying their best to hit on old ideas by bringing them back to life, I am a big fan of monochrome and spent countless hours in my wee darkroom producing 10″x8″ glossy Ilford prints, so I talk from fond experience. My Mamiya C330 camera took 2 1/4″x2 1/4″ square negatives but you either used B/W or colour film, you didn’t buy a monochrome only camera ! I think we are trying to please all disciplines today with the photography/video all in one box it’s leading to a quick fix…”heres a video and some stills”. I am not a fan of “one box does all” I certainly question the need for a monochrome only camera when we have such good plugins today and its the old story once you commit to B/W you can’t go back and colour your footage. Don’t get me wrong monochrome used in the right context can look very dynamic but when colour is 95% of your workflow to spend $25,000 on a camera body that only produces black and white is like 3D cinematography…a passing phase.